Click here for a Letter from Jennifer Lee Carrell. Kate Stanley returns in this thrilling follow-up to the New York Times bestselling Interred with Their Bones. Jennifer Lee Carrell's fiction debut, Interred with Their Bones, was greeted by both fantastic reviews and stellar sales. 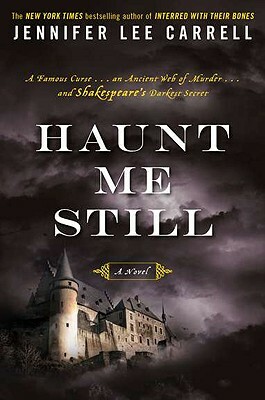 Already a bestseller in the U.K., Haunt Me Still marks the much-anticipated return of Kate Stanley, Shakespearean scholar and theater director. This time, Kate becomes embroiled in a murder surrounding Macbeth, the Bard's famously cursed play. As Kate and company begin rehearsals at the foot of Scotland's Dunsinnan Hill, she discovers a local woman dead in circumstances that suggest ancient pagan sacrifice. Marked as both suspect and future victim, Kate undertakes a desperate race to find a dangerous, alternate version of Macbeth-reputed to be Shakespeare's darkest secret. Jennifer Lee Carrell holds a Ph.D. in English and American literature from Harvard University and is the author of The Speckled Monster: A Historical Tale of Battling Smallpox. In addition to writing for Smithsonian magazine, Carrell has taught in the history and literature program at Harvard and has directed Shakespeare for Harvard’s Hyperion Theatre Company. She lives in Tucson, Arizona.